You have time to order and make something your amazing teacher will love! Or, you can just order one of these amazing kits to give to your awesome teacher to enjoy their own crafty break! Teacher Appreciation Week is May 5 - 9th. Mothers Day follows on its heels on May 11th, and then at the end of May and into June we will be enjoying the Graduation season. These products I'll share below are available until May 31 as part of our Occasions Catalog. or I have included the links to each product in the titles below. Orders usually take 1-3 days to ship, but will ship directly to you. Expedited shipping is available. Kits are an easy way to get everything you need for a project, without having to figure it all out yourself and spend a fortune! This makes them perfect for giving as a gift, a nice little creative escape for your recipient; but also pretty brilliant to keep on hand for that last minute gift you can make, or to enjoy a break from your regular crafting! Everything is precut, premeasured, and coordinated, with instructions and photos so you can stick to the directions - or branch out and explore your own path of creation! You'll end up with a great handmade item! Parties are easy when when you start with this kit to create the foundation for your party décor. Finish it off with a Celebration Add-On Kit. This is a great banner, with some perfect other items in the kit to use for a party, but the banner - really easy to assemble, and sturdy enough that you can pack it away to use again later! You can spell out Celebrate - which is perfect for most any occasion, or you can use your Boggle skills and spell out something else... like Create, for a creative space like a classroom or craft room, or Elect for school elections, or Cereal, Trebel, Race, Tree, Bear. Ok, my Boggle skills are few, but you get the idea. Google says there are 186 words you can make from the letters CELEBRATE, so you have options!! You can also cut out and add your own letters, making any word your little heart desires! Maybe a team name, or your classroom college or mascot, different holidays or celebrations... Its a versatile banner! Great gift for Mothers day - embellish with flowers, or hang over a nice tablescape and you'll wow Mom! Great gift for Teachers to use in their classrooms, and if you bring it in to Clelebrate the teacher, they can re-use it to Celebrate the end of the year! Or the start of the new year... You get the idea. An easy and great looking banner for all your celebrations. a pretty coral (pinkish) addition, with gold and grey accents, that includes some fancy paper you can add behind the letters on your banner, or use to add to your invitations or party decor, and a beautiful garland of coordinated circles sewn together. A bunch of sweet elements to add a splash of color to a girls baby shower, or a princess party, or a ladies brunch or tea. The colors are feminine, sophisticated, and easy to coordinate with. this crisp bright blue, with accents of grey and yellow, is another great option to add some color to the basic kit. Perfect for a baby boy shower, a cool beach theme or pirate party, or other summer get together. Very fun, bold, and modern. You can see my posts on this super fun kit HERE, I just love it!! The colors are very much for spring, and mild enough to go well with any decor. A great gift for mom, to make or receive as a kit to make, but this is really a fun kit to enjoy in a group - get together and make these for your teachers as a PTA gift! Your sorority group, or ladies group at church, coworkers, neighbors, etc :-) would have a fun time sitting together and making these! Its not difficult, you just need a hot glue gun. 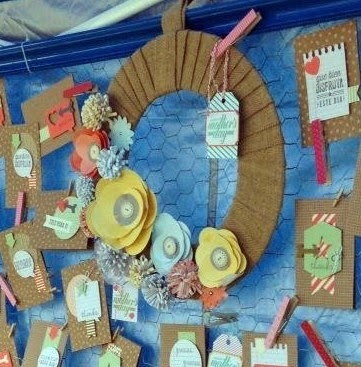 It includes everything already cut, you just follow the instructions to assemble the flowers, and then arrange them to your liking on the burlap wreath. Very soft spring colors, pink/coral, light blue, grey, yellow, and white, on a burlap ribbon wrapped wreath form. Great addition to your brunch decor, or to a cubicle or classroom. 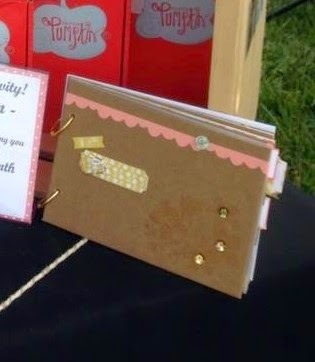 This sweet little album would be a nice way to preserve or highlight your memories of a special someone (MOM! Teacher! Graduate!) or to share the adventures you had on a (field-)trip, or vacation, or show how much someone has grown over the year(s). It comes with adhesive pieces, little accents, and journaling tags, you just assemble and add your own photos and mementos. A sweet gift to give to Mom that you have completed for her, or a nice gift to give the graduate or teacher to take on that summer vacation! This is a versatile little card kit! 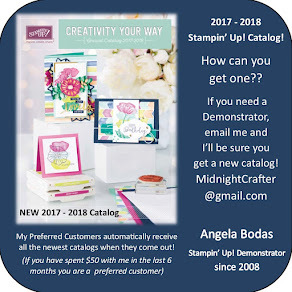 In just minutes you can make 15 cards, and though it does not include a stamp set, you can personalize the cards with the set of your choice, or use them as blank note cards for any purpose! The colors are gender neutral, so these will work for either Mom or Dad, and what teacher or graduate doesn't need a stack of note cards on hand?!? Make them and tie them up with a ribbon for a sweet useful gift, or give them the kit and let them enjoy the ease of creativity that comes with using one of Stampin' Up!s great kits!! These are just a few of the kits we offer, and I have even more ideas for you if you are looking to put together a basket or bag for a gift. Let me know what you need help with! 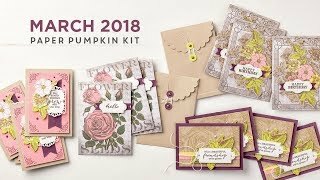 We also offer a great monthly subscription kit, Paper Pumpkin, which you can now purchase prepaid subscriptions for - a great gift that will keep on giving! Its got a different craft project each month, everything you need is included in the box with instructions. Happy Crafting - and Gifting!